Discussion in 'Minecraft Frontiers News and Announcements' started by Tomas, Jan 24, 2019. Minecraft Frontiers is a custom-built, innovative historical experience. The server is unlike any other, placing focus on community building, role-play and meaningful decisions. The project has seen over 60 staff members chip in to create a world that's both authentic and exciting at the same time. The best news? It is opening soon! If you have been following us over the years, this may come as a surprise. I'd like to devote this post to answering some of your questions and most importantly, revealing what's in store for Minecraft Frontiers. Make sure to read all the way to the end, there is a lot to announce! We all find ourselves dreaming of distant worlds. What if there was an inspiring universe you could not only explore, but also shape and claim as your own? In 2013, I've been toying with this idea. Most games succeed in terms of creating a breathtaking world. Often times though, you feel like an unimportant visitor. I had the vision of a space that players could shape - a Lego set that comes alive. In this world, you would feel a cautious visitor - not due to a lack of significance, but because you understood your actions deeply shape the environment. The project has been going for 6 years, with 60 staff members flowing through. This is a conservative estimate not including our part-time builders. Counting our prototype testers, we had over 200 people helping make the vision a reality. If you are one of our older members reading this, know that I am genuinely grateful for your time with Minecraft Frontiers. In the end, it is the community that has overgrown the initial ideas and made us into what we are today. Authentic World - making a story that is worth living. Player Power - letting players make choices that matter. Community - building the whole project with the community in mind. We have always seen this as a project run by the players for the players. This is deeply rooted in our project culture - starting all the way in 2013 with me inviting the first co-founder, to the community-centric plans we announce today. In the Summer of 2016, right after our second prototype stage, we announced a closure of the project. There were a few reasons for this. If you'd like to read the detailed thoughts from back then, feel free to indulge in the lengthy closing announcement. All of the reasons can be summarised easily - burnout. We had been working on Minecraft for 5 years, 3 of which were on Minecraft Frontiers. It was difficult for me to keep motivating not just the team, but myself. We stored the code and all of our plans, shelving them for some point in the future. Most of the team went our separate ways, with a small group keeping in touch on our Discord server. We developed other non-Minecraft projects, played online and offline games, and generally explored life. Most of us made the transition from high school to university. Some of us from university into the big pond. Even though the project was shelved, we still looked after the assets. The website server was never cancelled - I never had the heart to pull the plug on it, so I kept paying every month. A few of our builders asked for the server map files, but nothing ever came of those projects as far as I know. The project was a sleeping beauty, one that never lost its breath of life. Let's stop beating around the bush. 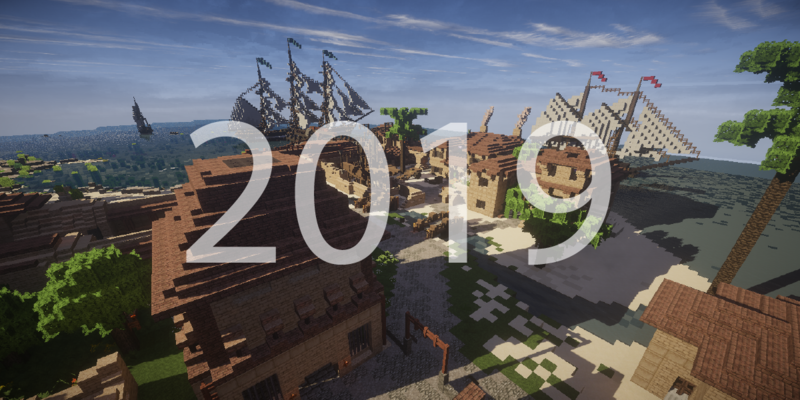 Minecraft is still very popular in 2019. Minecraft Frontiers is an exciting idea. And now we have the motivation and skills to make a real difference. That is the mood of our core team in 2019. We are dedicated to bringing you a Minecraft experience unlike any other and we are more passionate about it than ever. This project has always been a work of love for all of us. Recently, the core team naturally gravitated back to the idea. The nice thing about taking a break is that we are returning with 3 years of fresh experience. The dev team is already hard at work on new features, both internal and external. The level of polish is impressive and the ideas we aim to tackle are virtually limitless now. In a way, this week feels like a homecoming. All of the key team members are discussing the direction of the project. It's familiar and a completely new frontier (no pun intended) at the same time. The MF team has always consisted of people who are the very best at what they do. They take ideas people say are impossible and not only deliver them, but expand them tenfold. It's exciting to work alongside the staff that we have. Reuniting with many of them recently has been a humbling experience, as they've become even more talented with their time off. With all of this in mind, we have a couple announcements to make. The project is closer to a public release than you might think. Much of our old content has never seen the light of day. At the same time, lots of new features have been developed since. Here is what you can look forward to. There will not be a Prototype 3. The server will have a full release, including all of our basic features planned. There will be regular updates with significant additions of features and content. The server will not have extended periods of downtime - once we launch, the experience will be available 24/7, fully supported by our staff. We have a 12 month content plan in terms of lore. This means that at this very moment, we have enough story to run weekly events for the rest of the year. The story is will be organised into three Story Arcs, each containing a very unique story relating to the city of Elpida. Each arc has four chapters, further broken down into four weekly events you can participate in. In other words, you will always have a story to tap into and the city of Elpida will be constantly evolving. Carpentry - A new crafting discipline all about building houses. You'll be able to craft house deeds that let players and cities construct new buildings. Enemies - With our full support of Minecraft 1.13, we will be introducing new monsters for you to fight. This means new content to explore, new loot and new combat behaviours to watch out for. Reputation - The reputation system will be there at launch. This will introduce factions into Elpida, giving your decisions real weight in terms of your character development. Items - From 120 custom items in Prototype 2, we are moving to 200+ custom items for you to collect and craft at release. Plots - A revised plot system, allowing you to build bigger and better buildings. The elected Prefect will have control over the city with new town buildings and amenities. Minecraft Frontiers now features a full soundtrack. 18 unique tracks will accompany you on your adventures. I am personally incredibly excited for this. We had 8 songs in Prototype 2 and I decided to spend on licensing ten more to make it a wholesome experience. Music is a key aspect of a game and letting you explore the world with 18 incredibly well-designed songs will convey the stories and environments in a whole new way. We will soon be accepting applications for 'community ambassadors'. This is not a staff position, but rather a player badge that represents commitment to helping new players learn the ropes of Minecraft Frontiers. As an ambassador, you will be a stronger voice in the community, a person others can rely on in terms of mentorship and keeping the community an exciting place for everyone. The server will launch with a party to be remembered - including live-streams, exclusive in-game items and prizes. More information on our release schedule in the very near future. It is a delight to be writing this post. Partly due to the amazing things that are coming, but also because of the community. Every single one of our members is an important part of the whole ecosystem. By announcing a bright future for Minecraft Frontiers, we invite you to make this space your own. We are here to deliver the best feature-set out there, while empowering you to tell your own stories. Feel free to comment on this thread, share your ideas for Minecraft Frontiers and post what you are looking forward to the most! Nico, Alir99, QuannTan and 1 other person like this. Here's a Discord invite link for all new members, Discord is a great place to get to know the community! @Tomas Might want to edit this into the post or put it on the sidebar even. Wow. What a surprise after all these years! I look forward to seeing the hard work of the countless builders, writers, and (most especially) developers pay off. @Saphiria I can't believe you're still around. All of your online accounts look dead. It is a long story... but I have a habit of checking this domain every few months out of hope. This is the first time in 2019. Let me know if y’all ever need help (I can give updated contact information). I look forward to seeing the map! Glad you decided to pursue this again!